The practice of organic gardening may seem intimidating and complex but it is not as difficult or expensive as you may think. While it is a different approach to gardening, it simply means finding new sources for your supplies and learning how to use them. Commercial organic growers are bound by strict government regulations but home gardeners have more flexibility. You can choose to garden organically, gradually phasing in new organic practices before you become a full-fledged organic gardener. The best way to start is from the ground up, so to speak. Healthy soil results in healthy plants that are more resistant to insects and diseases. If the friability or drainage of your soil needs improvement, use natural amendments such as dried leaves, compost, or manure. I favor well-composted horse manure with shavings from local stables because it is available by the truckload and is relatively inexpensive. Many states have local agricultural newspapers that are filled with ads offering various types of manure and compost. Your State Department of Agriculture can direct you to the publication that best suits your needs. Of course, you can always find these amendments cleanly bagged at your local garden center or home improvement store. After amending your soil, have it tested through your local county extension office. (Be sure to follow the test instructions so that you get accurate results.) Once you get your test results, use organic compounds in place of synthetic ones to balance up your soil. The tests are typically calibrated for synthetic fertilizers, so you may not be able to find organic fertilizers in the same exact ratios. You can find instructions on how to convert inorganic fertilizers from your soil test report to organic ones here. Next, begin the use of organic pest controls. There are many great products available. You may find that local garden centers and home improvement stores carry a limited selection. For more choices, shop the web. Some excellent sources I have found are Gardens Alive, Extremely Green and Golden Harvest Organics . The key to successful insect control is consistent and proper application. After you are comfortable using organic pest controls, begin using organic fertilizers. Fish emulsions are the most readily available and can be applied using a foliar spray application or just watered in. Don’t be concerned about odor. The smell dissipates fairly quickly. Just don’t get it on your clothes or all the neighborhood cats will be eyeing you hungrily! Organic seeds are the next step. Again, the widest selection will be through the web. Most catalogs clearly indicate whether seeds are organic or not. Organic seeds come from plants that are raised organically. They are important because they promote plant diversity and are not genetically modified. Usually organic seeds are open-pollinated varieties, meaning that if you save the seeds from these plants they will reproduce true to form. This is a key factor in preserving heirloom varieties. Check out Seeds of Change. Lastly, explore ways to control weeds without using chemical herbicides. Mulch is one of the easiest ways to keep weeds down. Apply a thick layer of pinestraw, shredded bark, well-composted wood chips, newspapers printed with soy-based ink or kraft paper to smother them. Hoeing and hand-pulling, if done consistently, are another great way to prevent weeds from taking over. Also, corn gluten can be used as a pre-emergent. Just don’t use it where you have seeds planted as it does not discriminate between desirable and undesirable seeds. 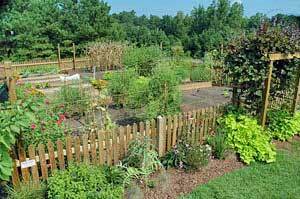 Organic gardening practices can be simplified by implementing them in stages. While I encourage you garden entirely organically, any step you take will have a positive impact. I have always been somewhat of a gardener but I purchased my home a couple of years ago and would like to begin gardening on these grounds. I have no clue as to what has been used on the grounds or what the soil has been exposed to. Where do I begin? I’m sure you will suggest the local county extension office to test the soil but i am unsure whether they provide soil testing in my area. Is there a different method that I could perform myself or ? Thanks 🙂 and I am so glad to have found this show and website. Sally, your local county extension agent is far better equipped to help you analyze your soil. However, the typical test does not include the information I think you are seeking. When you talk to your agent, be sure to tell them specifically what you are concerned about to see if they are able to offer that level of testing. However, you can also do an internet search of “private soil testing labs”. Some will work with homeowners and have a vast array of options for the type of tests they offer. Depending on what you need done will determine the price. Although more expensive than the county service, you get what you pay for and likely exactly what you need / want to know if you find the right private service. Just ask both co. extension agent and private lab and you’ll know what to do. Good luck. Hi Frank. In my opinion, the best place to start is the University of Florida Cooperative Extension Service. From here, you’ll find a wealth of information, including the ability to contact your local Master Gardeners who can give you specific information related to your climate and zone. Here’s the link to get started. Good luck!